Sushi Kit from Tiger Sushi! All you need to have a sushi party is your ingredients - rice, nori, and your choice of fillings. Everything else is included in the box, including a rice spoon to cool down the rice, spatula for spreading and even a knife for cutting! Aside from the traditional round sushi maki roll, this kit provides you the tools to make maki into square, triangle and heart shapes. It's quite impressive and you can create those beautiful maki just like those in the restaurants! 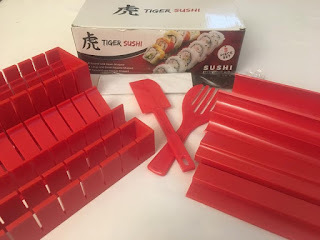 Once you have created the sushi in the molds, the built in knife guide in the mold allows you to cut your sushi masterpiece easily and safely with the included knife. It makes presentation a breeze!